Nikyra Washington chose Knox College in Galesburg, Illinois, to pursue an education major for many reasons. Primarily, she wants to teach. Also, students had a voice at Knox and could make a difference, something she wanted to experience in college. “I also noticed Knox really pushed students to learn how to critically think,” she says. And, she is taking advantage of Knox’s liberal arts offerings, adding a double minor in Africana Studies and Spanish. A junior from Evanston, Illinois, Washington says she hopes to teach fourth graders. “I’ve worked with elementary school students for three summers now. I really liked it. At the same time, I love all students. I work with middle-school students and high-school students as well. Any opportunity I get to work with students is an amazing opportunity for me,” she says. Another possible career is working on school equity issues, to help students get what they need in school, she says. While at Knox, Washington is a resident advisor, is now in her second year as president of the Allied Blacks for Liberty and Equality, and is a member of the Multicultural Students Advisory Council. She is also a tutor for the Center for Intercultural Life. 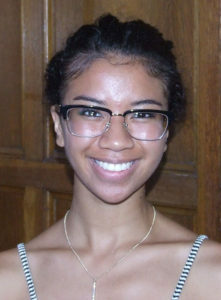 Washington helps finance her college education with an ACI General Scholarship. ” If I didn’t have the funds, I would be able to come to college,” she says. “I love school. So, being able to have the opportunity to receive my education and to pursue what I want to pursue is super important and super amazing that I can even do this.” Scholarships change families, Washington says, adding that she and her siblings all hope to earn college degrees. Camille Pruvost chose to attend Principia College in Elsah, Illinois, to explore questions of theology and religion as part of a double major with music. She also chose Principia because she knew she could study in an environment where she could express her faith and be safe. Pruvost, a fifth-year senior from Ft. Lauderdale, Florida, says small classes and the liberal arts experience at Principia has helped her grow, too. “At Principia, I get to explore not only questions of religion and theology, but sciences that I have loved in middle school, like earth science. I’m taking a geology course right now,” she says. “I get to explore politics, writing courses and different literature from around the world.” Pruvost has also studied abroad in Paris, Prague, Vienna, and Northern Ireland and the Republic of Ireland. To Pruvost, music is a way to express ideas about religion and theology. After Principia, she hopes to attend a seminary, and earn a master’s degree and doctorate, studying topics such as religious epistemology and apologetics, with a concentration in theodicy of the problem of evil. “With all of that, my ministry would then be a music ministry – recording and healing through music,” she says. Pruvost is a soloist at her church, religion tutor and writing tutor. She helps in the music department and has been treasurer and secretary of Phi Alpha Eta, a scholastic honor society at Principia. She says her ACI General Scholarship has made it possible for her to continue singing. “It has meant that I’m able to continue taking voice lessons this semester,” she says. “Because my major is music, it means I’m keeping up on vocal lessons. Having to cover that as well for a fifth year would have been a lot for me personally. So ACI meant that I could continue.” It also means she can plan for another study experience abroad to Jordan, Israel, the West Bank and Palestine.